Generally from fall on outstretched hand. Most common mechanisms of injury include: hyperextension and "punch" mechansim. During "punch" mechanism the force is transmitted to the distal pole of the scaphoid through the index metacarpal and trapezoid. Annual incidence = 4.3/10000 people (Hove LM, Scand J Plast Reconstr Surg Hand Surg 1999; 33: 423-426). The majority of the blood supply to the scaphoid enters at the dorsal ridge. Bipartite scaphoid occurs rarely and may represent asymptomatic nonunion (Doman AN, J Hand Surg 1990;15Am:869). PA, Lateral, Scaphoid views of the wrist. Consider fisted PA view and posteroanterior grip view. 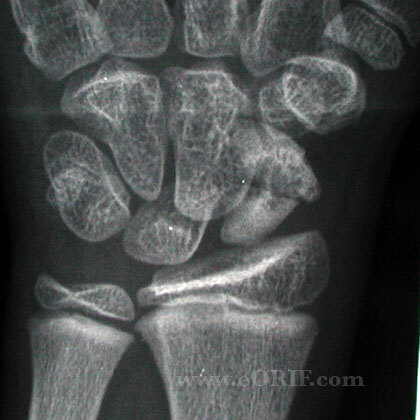 CT scan: demonstrates the exact amount of displacement and loss of intrascaphoid and intercarpal alignment. 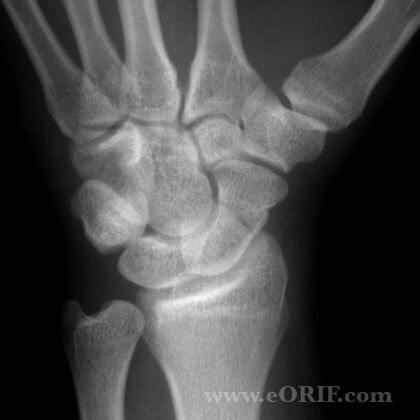 MRI: helpful for occult acute fractures (especially proximal pole) and determining vascularity of scaphoid nonunions. Stable (displacement <1mm, normal intercarpal alignment, Distal Pole fracture ): Short arm cast; consider percutaneous fixation. Contraindications to casting: displacement or angulation, small proximal pole fracture, concomitant scapholunate ligament injury, ipsilateral distal radius fracture, perilunate dislocation. Proximal pole fractures are unstable even when initially aligned = 30% nonunion rate with cast treatment. (Gutow AP, JAAOS 2007;15:474). Nonunion=failure to heal in 6 months. 5-10% for undisplaced, up to 90% for displaced proximal pole. (Hambridge JE, JBJS 1999;81Br:934). Casting Complications: disuse muscle atrophy and osteopenia, delayed union, nonunion, pressure nerve palsies, cast sores / pressure sores. 7-10 Days: remove splint. Place in short arm spica thumb spica cast. Consider removable splint with gentle ROM if fixation was extremely secure. Cooney WP III: Scaphoid fractures: Current treatments and techniques. Instr Course Lect 2003;52:197-208. Cooney WP, Linscheid RL, Dobyns JH, Wood MB: Scaphoid nonunion: Role of anterior interpositional bone grafts. J Hand Surg Am 1988;13:635-650. Fernandez DL: A technique for anterior wedge-shaped grafts for scaphoid nonunions with carpal instability. J Hand Surg Am 1984;9:733-737. Stark HH, Rickard TA, Zemel NP, Ashworth CR: Treatment of ununited fractures of the scaphoid by illiac bone grafts and Kirschner-wire fixation. J Bone Joint Surg Am 1988;70:982-991. 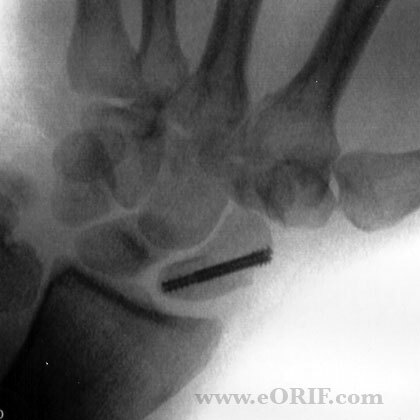 Feldman MD, Manske PR, Welch RL, Szerzinski JM: Evaluation of Herbert screw fixation for the treatment of displaced scaphoid nonunions. Orthopedics 1997;20:325-328.